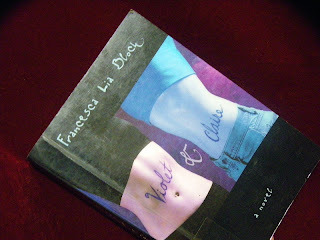 Violet & Claire by Francesca Lia Block is a lyrical, experimental young adult novel set in the rich, disconnected communities around Hollywood (or some fictional similar place). It's about two very different, very unique girls, who come to love each other more than anything else in their lives. I'm not sure I'd call this a lesbian book. Rather, I'd call it 'open to interpretation'. There are two girls, two very odd and very alone girls, who meet their perfect opposite in each other. Whether they are 'just' friends, the one exception to otherwise heterosexual or asexual lives, or actually bisexual or lesbian, I couldn't tell you. I daresay if you asked the author, she'd say something about whatever you wanted them to be (Francesca Lia Block is an LGBTQ-friendly author; she's written the acclaimed queer-friendly Weetzie Bat books, which I haven't read, so I can't tell you if the acclaim is accurate or not!). We know they do love each other, in some way, and are almost each other's only friend, dependent and protector, and this is obvious to the people they meet as well. "You're two halves of a whole." Esmeralda whispered. "I knew it the first time I saw you"
Violet Samms is a film addict, a "girl with a mind like a miniature move theater". Movies, film making, the big screen is her obsession, and has been both her entertainment and her escape since she was a tiny child. Rich and lonely daughter of two perfectly boring parents, her late teenage mind is wholly focussed on the screenplay she is writing. A screenplay that mixes confusingly with her life, as she seeks out experiences and players in her plot. Conflict, she says, I want conflict. Claire is a flower child, a wild and innocent wanderer who grew up running alone in the woods, but has been transplanted into a community of ordinary people, to wander vaguely through life, attend high school with wings on her back, and proclaim to the world that she's the descendant of fairies. She's "[t]he girl whom the boys thought was a fawn and tried to shoot, the girl who could fly when no one was looking, the girl with the wings on her skinny back and the child's mouth that was like too many flowers." Violet notices Claire when she arrives at her school, and sweeps her up, attracted by her suitability as an actress in Violet's film. The way Violet goes on about her script and her film, and how she needs this and that, it feels like make believe. The events often seemed to be a metaphor, a coping mechanism, like Claire's faeries. So there's an odd whiplash when I realise that yes, Violet really did become a famous scriptwriter and is now moving in the hard, loud, dangerous circles of Hollywood showbiz, and that everything actually happens. At first, the girls seem younger than they are, meeting in school, hanging out together - and then hard-edged Violet is moving in adult circles, happily engaging in one night stands, becoming famous and dropping out of school, while delicate Claire is almost-dating an older man. But Violet's out of her depth, and though Claire adores her poetry teacher, she doesn't have any interest in sleeping with him. He seems more an idealised father-figure and friend to lonely, single-parent Claire. He's also a slightly predatory figure who clearly adores Claire back, and encourages her in being herself, but also moves on to the next girl to turn up at his poetry circle with barely a qualm, when she proves a flower too difficult to pluck. Violet despises him, but ends up bonding in an odd way over their shared, semi-futile love of Claire. The supporting characters are vivid, but mostly unlikeable, and their appearances are very fragmented, as they appear in the scenes of Violet and Claire's lives (which I think accounts for the difficult emphasising with them - we don't see enough of them, just how they affect the protagonists). There's no real sense of place or time, while the girls do go to the city, and school, and home, there are no transition scenes. They're just 'there'. The sense of time passing is just as hard to pin down. It's an odd, experimental book. I didn't really enjoy it, at least not until the final scenes when the story became more recognisable and events moved in a logical way, and when all the poetry and fancifulness worked. The rest of it was rather random, with major events happening offstage and barely explained, while we follow the impact of said events on the girls. Chapters alternated between first person and occasionally a joint third person. Their voices were strongly written as them - Violet being a slightly cool, modern teen, while Claire was much more lyrical. The third person chapters were much easier to read, and I found that Violet's voice was aggravating and felt a little forced - but other people may prefer it. The ending was rushed, but so was the whole book, and slightly less disjointed. It's a book that sounds more impressive that it is. On the other hand, from the Amazon reviews, many people loved the magical realism, and strongly identified with the two girls, so this is clearly a book where your mileage may vary. It's a book which lends itself to rich quotes, in which the plot isn't the main focus, but the relationship of the characters - not even the characters themselves, but their relationship - took up almost all the attention. "A dusty Mustang was parked below. A girl got out. Claire could hardly see her because of the huge bouquet of roses and lilies she was holding. Still, she recognized her. Violet looked up as if Claire had called to her and they stood there like that in a meteor shower, in a silvery wind, in a spell of flowers, neither of them moving, and then Violet tossed the bouquet upward. Claire could not fly away into the ice-white light of faeries. And Violet could not hide in the dark movie theater where everything could happen and none of it meant anything, finally. Claire could step to the edge of the rock and climb down. Violet could hold out her arms, reach up, and catch her friend's wingless body. Two girls, blending themselves together like a magic potion, and then separating, one more powerful and one more gentle after the alchemy, neither afraid anymore". I'd pass this book by if you just want a good book to read. But if you want something different, sideways, poetical, and you don't mind the lesbian subtext being subtext, or want a book full of randomly inspiring and vivid passages, though they aren't connected particularly smoothly, you may find Violet & Claire interesting.